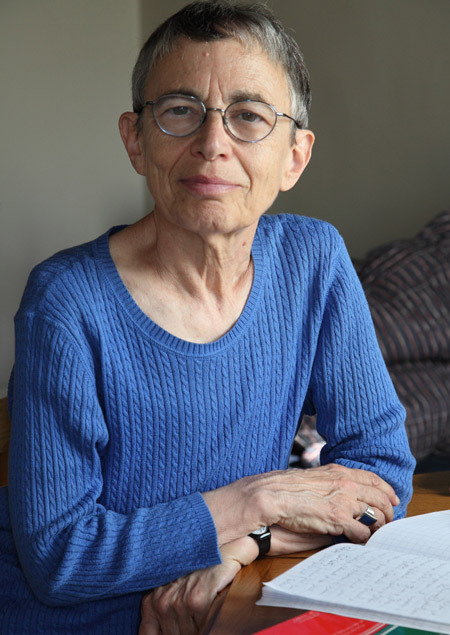 Marilyn Hacker is the author of twelve books of poems, including Names (Norton, 2010), Essays on Departure (Carcanet Press, 2006) and Desesperanto (Norton, 2003) and an essay collection; Unauthorized Voices (University of Michigan Press, 2010). Her twelve volumes of translations from the French include Marie Etienne’s King of a Hundred Horsemen (Farrar Strauss and Giroux, 2008), which received the 2009 American PEN Award for Poetry in Translation, Emmanuel Moses’ He and I (Oberlin College Press, 2010), and Rachida Madani’s Tales of a Severed Head (Yale University Press, 2012). For her own work, she is a past recipient of the Lenore Marshall Award for Winter Numbers, the Poets’ Prize for Selected Poems, the National Book Award for Presentation Piece, an Award in Literature from the American Academy of Arts and Letters in 2004, the American PEN Voelcker Award for poetry in 2010, and the Argana International Poetry Prize from Morocco’s Bayt as-Sh’ir (House of Poetry) for 2011. She is a Chancellor of the Academy of American Poets. She lives in Paris, and is an editor of the journal Siècle 21. During 2009 – 2013 she worked with Deema Shehabi on the great poem sequence Diaspo/Renga.